A robot working in public spaces must not frighten the surrounding people. However, this could occur if it is not evident that the robot is safe. To avoid frightening people, the robot must be designed with both safety and appearance considerations. However, few relevant design theories have been developed. In this study, a mobile robot was designed using a concept that eliminates dangerous elements from the mobile robot’s appearance. Finally, we developed a mobile robot with a flexible cowl based on safety and design property considerations. Y. Kakigi, K. Inoue, M. Hijikata, and K. Ozaki, “Development of Flexible Cowl Covered Mobile Robot in Consideration with Safety and Design Property,” J. Robot. Mechatron., Vol.29, No.4, pp. 630-638, 2017. “Service Robot Terms, B0187,” Japanese Industrial Standards, 2005. C. Nakagawa et al., “Experimental Study on the Influence of the Size of Personal Mobility Vehicle on Pedestrians,” Trans. of the Japan Society of Mechanical Engineers, Vol.78, No.794, pp. 3332-3342, 2012. K. Inoue et al., “Proposal and Consideration of Design Policy for Autonomous Mobile Robots in Real World Robot Challenge,” J. of Robotics Society of Japan, Vol.30, No.3, pp. 234-244, 2012. H. Morinaga, “Vacuum Forming Method,” J. of the Society of Rubber Science and Technology, Japan, Vol.34, No.6, pp. 479-486, 1961. T. Yoshida et al., “A sensor platform for outdoor navigation using gyro-assisted odometry and roundly-swinging 3D laser scanner,” IEEE/RSJ Int. Conf. on Intelligent Robots and Systems, pp. 1414-1420, 2010. 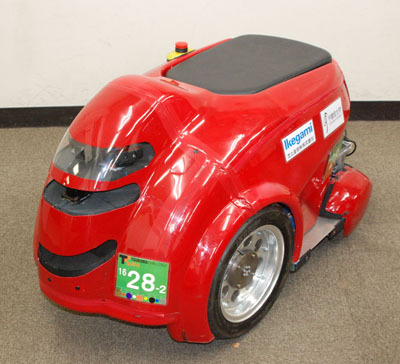 T. Tomizawa et al., “Development of an intelligent senior-car in a pedestrian walkway,” Advanced Robotics, Vol.26, No.14, pp. 1577-1602, 2012. S. A. Rahok et al., “Navigation using an environmental magnetic field for outdoor autonomous mobile robots,” Advanced Robotics, Vol.25, No.13-14, pp. 1751-1771, 2011. N. Akai et al., “Development of Mobile Robot “SARA” that Completed Mission in Real World Robot Challenge 2014,” J. of Robotics and Mechatronics, Vol.27, No.4, pp. 327-336, 2015. N. Akai et al., “Development of Autonomous Mobile Robot that Can Navigate in Rainy Situations,” J. of Robotics and Mechatronics, Vol.28, No.4, pp. 441-450, 2016.